West Ham stars Mark Noble, Marko Arnautovic, Javier Hernandez and Robert Snodgrass tried their hand at a game that looks ridiculously fun – Crazy Snooker. 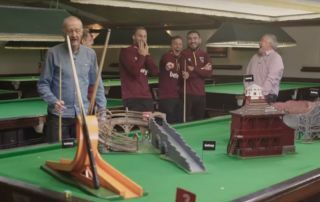 Joined by snooker legends Steve Davis and John Parrott, the Hammers stars were divided into teams alongside the legendary duo to try and work their way around some fiddly looking courses on the snooker table. All in all, they took on six different fiendishly tricky courses – the Helter Skelter, the Water Wheel, the Loop-the-Loop, the Runaway Train, the See Saw and the Trap Door – and produced an epic contest that featured some amazing snooker trick shots as well as a few hilarious misses. The game was brought to you by Betway ahead of the 2018 UK snooker championship and looks like a genuinely great laugh as the West Ham players in the video get fiercely competitive. The game ultimately ends in a draw between two evenly-matched sides, with Hammers players, to their credit, showing themselves to be as adept with their snooker cues as with their feet. As the real snooker approaches, Ronnie O’Sullivan is widely expected to win a record-breaking seventh title, with the Arsenal fan a far more prolific winner of trophies than his club. West Ham, meanwhile, are not in the best of form right now, winning just two of their last eight games in all competitions as they remain in the bottom half of the table. Still, Betway have them at 4/6 favourites to beat Cardiff City in their next league match, so Noble, Arnautovic, Hernandez and Snodgrass will be hoping things can take a positive turn for them on the football pitch soon too. Arnautovic, however, may not necessarily remain a Hammer for that much longer after the Austrian was recently linked as a target for Manchester United, with odds of just 4/1 being offered on him moving to Old Trafford this January.